Olive groves and vineyards, forests and flowers – there’s much to love about the abundant natural beauty of Umbria, and plenty of walking trails to help you explore it. The two most high-profile towns, Assisi and Perugia, have spiritual and cultural gravitas in equal measures, the former the erstwhile home of St Francis, who built his famous monastery there. And after a day of contemplation, in churches, galleries, museums and nature, the ‘green heart of Italy‘ will reward you with a generous feast and a glass or two of its famous wine. To complete your Umbria holiday experience, visit our handpicked luxury villas. "Who could ask for more? Villa Donatella is beautiful, quiet and peaceful with fantastic views. Nooks and crannies to explore and an excellent pool." From smoothly rounded cypress-covered hills to lush valleys, through the Tiber’s central basin to the rugged Mont Sibillini along its eastern edge, Umbria abounds with natural beauty, much of it uninhabited. This ‘green heart of Italy’ boasts olive groves and vineyards, chestnut forests and fields of flowers. And for moments of peaceful contemplation, there are hiking trails and pilgrims’ tracks to guide you. As Umbria is Italy’s only province with neither coast nor foreign border, the region also has a well-developed sense of history, community and belonging – but visitors are warmly welcomed into the fold to enjoy convivial meals with local wine flowing. There are many easy walking trails woven into the gently rolling landscape, around reed-fringed Lake Trasimeno or into the woods of Monteluco. For more of a challenge, there are mountain hikes, including those through the Monte Subasio nature reserve, and a series of long-distance cycling routes too. St Francis of Assisi, St Clare, St Benedict of Norcia – and millions since – have made Umbria a place of pilgrimage and you can follow in the footsteps of Italy’s famous patron saint along way-marked routes for all levels of fitness. While spiritual enlightenment may (or may not) be forthcoming, everyone can relish the mystical quality of Umbria’s late-afternoon sunshine. Umbria’s fortified hilltop villages and towns aren’t only living monuments to the skills of ancient architects and craftsmen, they’re often the guardians of exquisite art too. The medieval town of Assisi – a UNESCO World Heritage Site – has beautiful pink-stone buildings lining its slopes and the Basilica di San Francesco contains extraordinary frescoes by Giotto, the Lorenzetti brothers and more. Gubbio, the region’s oldest village, has an astonishing array of architecture including a cathedral, Consul’s Palace and Ducal Palace. Meanwhile, Orvieto’s Duomo is one of the masterpieces of Italian Gothic art and Spoleto combines medieval and Renaissance buildings to memorable effect. Sprawling Perugia, Umbria’s capital, has a reputation for hosting influential expos and, with two universities, it’s a vibrant combination of forward thinking café culture and historical reflection. Within its ancient town centre, you’ll find cobbled streets, fine Etruscan and Roman monuments, a raised medieval walkway and the impressive Gothic palace: the Palazzo dei Priori. This grand building is now home to the impressive Galleria Nazionale dell'Umbria, an art gallery of international renown with a collection of paintings and sculptures from the 13th to 19th centuries. It includes pieces by Perugino, the town’s most famous native painter, as well as paintings by other Umbrian masters. The elusive truffle is very much an Umbrian speciality, but with a geography and climate well suited to agriculture and viniculture, there’s also a plentiful supply of olives, pulses, cheese, charcuterie and other fresh local produce. And this rich culinary heritage is part of almost every summer festival too. As well as a number of religious Feast Days across the region, Perugia boasts two contrasting yet equally successful annual festivals: Eurochocolate and Umbria Jazz, both attracting a global audience. Elsewhere, you’ll find Gubbio’s Corsa dei Ceri (Candle Race) and the medieval celebrations in Assisi (Calendimaggio). Simple and rustic, Umbrian cuisine relies heavily on what’s in season from its rich soil, dense forests, plentiful lakes and busy farms. Menus are based around typical cucina povera (peasant cooking) with ingredients that include beans, mushrooms, asparagus, onions and celery – and the rich flavours of olive oil and truffles, plus lamb, pork or game (grilled or cured) all feature too. Truffles are an important component for hors d’oeuvres – including crostini al tartufo and crostini alla norcina – and also used to flavour pecorino and formaggio di fossa (pit-ripened cheese). Truffles also accompany spaghetti (or the local variation, strangozzi) while other pasta highlights include a fish-based umbrichelli in salsa di Trasimeno and spaghetti col rancetto with bacon and cherry tomatoes. Umbria boasts two tasty soups, one made with chickpeas and the other with chestnuts. These – alongside pappardelle alla lepre, a wild hare ragout – are enjoyed with regional bread such as pan caciato and pan nociato. The unsalted bread of Terni, or classic rustic bread known as brustegnolo, are favourites too. Typical mains include Terni’s colombaccio selvatico (a wild pigeon dish, spit-cooked before being placed in a casserole pot with a ghiotta sauce) and gallina ubriaca (literally, ‘drunken hen’). The latter gets its name from the copious amounts of local wine used in the recipe. Generally reserved for special festivities or religious ceremonies, traditional oven-baked Umbrian desserts often include almonds, spices, honey, or candied fruit. Panpepato is a cake eaten across the region, while ciaramicola is unique to Perugia and traditionally baked for Easter. Umbria’s chocolate-producing history dates back to 1907, with the making of Baci from ground hazelnuts and dark chocolate. The locally produced wines provide an excellent accompaniment to the regional cuisine, and some have gained a reputation beyond this land-locked region. 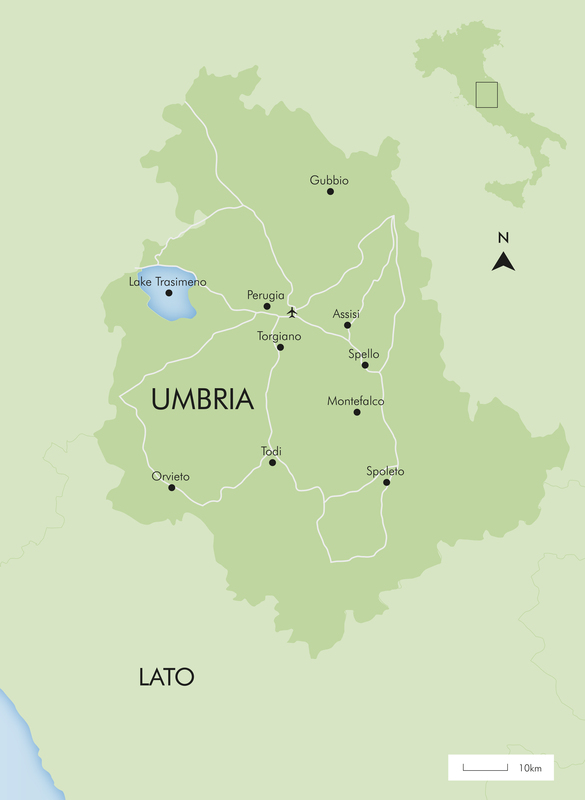 Umbria’s famous white wine is made from Grechetto grapes, largely found in the Orvieto and Assisi regions, often bearing that name. The flagship red is Sagrantino di Montefalco, made from a grape that’s found virtually nowhere else in the world. The sweet (passito) version is better still. Medieval, pink-stoned Assisi sits enticingly on Monte Subasio’s slopes. The town’s famous son, St Francis, was born here in 1181 and is buried in the impressive Basilica that takes his name. Other Franciscan sights worth a visit are the peaceful San Damiano, rural Eremo delle Carceri and the Basilica di Santa Chiara. However, St Francis doesn’t hold the monopoly on magnificent spectacles. Visit the Romanesque Duomo (cathedral) plus the Roman temple façade (Tempio di Minerva) in the main Piazza del Comune too. Overlooking the Val di Chiana, this charming medieval town is where you’ll find Via Della Baciadonna, reputedly Italy’s narrowest street and so named because if you lean out of a window on one side, you’ll be close enough to kiss a woman living opposite! There are also stunning Renaissance frescoes by local artist Pietro Vannucci (Perugino), who taught Raphael, and an elegant main square. To experience the town at its most vibrant, visit during August’s spirited 12-day Palio dei Terzieri. Visible from afar and framed by the slopes of Monte Subasio, Spello’s medieval houses stretch across the terraces above the Vale of Spoleto. Within the town walls however, the homes fight for space and it feels more claustrophobic rather than charming. However, the vivid frescoes by Pinturicchio in Santa Maria Maggiore, and the paintings and sculptures in the museum next door are worth seeing. Spello is also a base for mountain hiking – all the way to Assisi if you like. With a backdrop of mountains offsetting its medieval buildings, Gubbio is one of Umbria’s most attractive towns. Explore the imposing Palazzo dei Consoli and its gallery and the fine interiors of the plain-faced Duomo. Or try the Palazzo Ducale (largely empty of furniture and period fittings, but with good views) that was built by Federigo da Montefeltro, the renowned Duke of Urbino. Alternatively, escape the architecture and take the funicular up Mount Ingino for views across the town and beyond. Perched on a perfect natural pyramid, Todi is the quintessential Umbrian hilltop town. The main square is an exemplar of early medieval piazzas and a popular film location. There are cafés around its flanks, the Duomo at one end (with beautifully carved and inlaid wood) and, within two palaces, the Museo e Pinacoteca di Todi featuring paintings and displays tracing Todi’s history. The nearby church of San Fortunato has an airy Gothic interior and a tower offering splendid views. Straddling an immense volcanic outcrop, the town has a Duomo with dazzling façade that took 300 years to complete. Inside, Luca Signorelli’s graphic frescoes of The Last Judgement take pride of place. The nearby Museo Claudia Faina recalls Orvieto’s rich Etruscan past and the 2,600-year-old Necropoli Etrusca (Etruscan tombs) are just below the town. The town’s deep well, the Pozzo di San Patrizio served as a place of refuge when the town was under siege: it was a popular papal bolthole when unrest ruled in Rome. The exterior of the Gothic Palazzo dei Priori – now an art gallery – features tripartite windows, an ornamental portal and fortress-like crenellations. For Renaissance frescoes, go to the medieval money exchange (Nobile Collegio del Cambio) or the Sala dei Notari, where the nobles once met. Although the mountainside Basilica di Sant'Ubaldo has interesting displays, the real pleasure is in the journey not the destination. Admire the picturesque valley below as open cages whisk you up the mountain, ski-lift style. Then enjoy a picnic, to spark the taste buds too. Alongside the cathedral, the 14th-century Palazzo Soliano houses a collection of bronze sculptures, etchings and drawings. Below the town are 440 caves previously used as fridges, wells, refuges (during WWII and Roman and barbarian sieges) and for catching pigeons – a local delicacy. The 10th-century Basilica di San Pietro boasts an eye-catching blend of gilt and marble, plus a Piet (of the Madonna supporting the dead Christ) by Perugino. Outside, the serene Orto Medievale gardens include the Cosmic Tree and Tree of Light and Knowledge, symbolising sacred stories. Run by local chocolate-maker Perugina, this wonderful Wonka-esque museum in Perugia honours the manufacturing process, as well as the highly desirable end result. Call ahead to book a one-hour guided tour in Italian or English and prepare your taste buds for the experience. St Francis chose the caves of Eremo delle Carceri, above Assisi, as his refuge-in-nature: a place for spiritual contemplation. The carceri (isolated places, or prisons) along Monte Subasio's oak-forested slopes are still peaceful today, so ideal for a reflective walk or peaceful picnic. Ipogeo dei Volumni is an underground burial site dating from 2BC, in Ponte San Giovanni, a suburb of Perugia. It holds the funerary urns of the noble Volumni family and, in the surrounding grounds, there’s a display of household artefacts and partially unearthed burial chambers. In a 17th-century mansion, Torgiano’s Museo del Vino tells the story of viticulture from the Bronze Age onwards, including its medicinal and mythological role over the centuries. There’s a display of Greek, Etruscan and Roman ceramics and wine-making implements and, of course, wine tasting. Rising high above Spoleto, the imposing 14th-century fortress of Rocca Albornoziana now contains the Museo Nazionale del Ducato and uses Roman, Byzantine, Carolingian and Lombard artefacts to trace the history of the local duchy. The Rocca was also once home to Lucrezia Borgia. Porchettiamo, in San Terenziano, is a celebration of all things pork, with food stalls, craft beers, workshops, tastings, music and walks. The Infiorate Flower Festival, Spello. On the eve of the Corpus Christi procession, locals spend the night creating colourful floral arrangements on the pavements. The ‘Quintana’ jousting event in Foligno is an historic parade with locals competing on horseback, followed by the chance to sample some excellent Baroque-inspired dishes. The Trasimeno Music Festival, Magione, curated by celebrated pianist Angela Hewitt, brings together international artists to perform in Magione’s Castle of the Knights of Malta. Spoleto’s ‘Two Worlds’ Festival is an internationally renowned event with opera, music, dance, theatre, art and more. Il Mercato delle Gaite gives you a taste of medieval life throughout the ancient districts (Gaite) of Bevagna. Expect craft workshops in book making, pottery and traditional cookery. The Festival of Saint Rufino in Assisi is a combination of solemn liturgies and spiritual music alongside a palio and medieval costume parade, in honour of the town’s patron saint. Ferragosto – Assumption Day – is a countrywide celebration and supermarkets, restaurants, public services and most tourist attractions remain closed. If it falls on a Tuesday or Thursday, the same applies to the Monday and Friday. The Palio dei Terzieri in Città della Pieve is a 12-day tradition, including competitions between archers of the various village districts, a historical parade and the opening of 14th-century stalls and taverns. Eurochocolate celebrates chocolate from around the world, and the local brand, Perugina, in particular, with tastings, chocolate sculptures and performances. Started in 1569 and completed around a century later, this Baroque basilica is one of the largest churches in Christendom. Sitting below the town of Assisi, it’s built on the site of the humble church where Francis lived, prayed and died. Visitors can see his cave-like quarters within the Porziuncola (little portion) chapel directly below the soaring dome. A museum displays relics and artefacts; there are nativity scenes gifted from around the world and a rose garden stands outside. This enormous and opulent basilica is split in two. The upper church – Basilica Superiore – includes a celebrated cycle of 28 frescoes of Francis's life by Giotto (although some argue that other artists contributed). The lower, and older, Basilica Inferiore more readily embodies the introspective spirit of Franciscan life, although there are divine works by Giotto, Cimabue, Lorenzetti and Martini. The Cripta di San Francesco (the saint’s elaborate and monumental tomb) is also in this lower section. Orvieto's soul-stirring Gothic cathedral took three centuries to complete and it’s not hard to see why. Its black-and-white banded exterior would be impressive enough, yet it’s also topped by an astonishing facade. This mesmerising display features rainbow frescoes, jewel-like mosaics, bas-reliefs and delicate braids of flowers and vines. Inside the Duomo, the art includes Luca Signorelli's magnificent fresco Giudizio Universale, which depicts the Last Judgement (at times grotesquely). Many experts believe that this surpasses the work of Michelangelo. This cathedral includes a monumental Gothic portal designed by Galeazzo Alessi in 1568. To the left of it stands a bronze statue of Giulio III by Danti and, to the right, the lovely 15th-century pulpit used by St Bernardino da Siena. The largely solemn interior is brightened by Barocci’s interpretation of ‘The Deposition from the Cross’ within the Chapel of St Bernardino da Siena and the St Onofrio Altarpiece (a frescoed panel) by Signorelli. This stunning 12th-century cathedral is the backdrop to Spoleto's Piazza del Duomo, which has a sloping staircase ideal for grand entrances. Eight rose windows, a Renaissance-style portico and a Roman bell tower feature outside. Inside, the important masterpieces include a fabulous fresco cycle by Lippi (whose tomb is here too) depicting the Life of the Virgin in four scenes. There’s also a painting by Pinturicchio, Carracci’s Madonna and Child and a signed letter by St Francis of Assisi. Built between 1508 and 1607 where some miraculous recoveries had occurred, the 'temple of consolation' is one of the highest examples of Renaissance art in Umbria. Its design is based upon the Greek cross and characterised by five cupolas (one central and one at each apsis). The light and airy interiors house statues of Pope Martino of Todi and of the 12 Apostles. In the northern apse, by the Baroque altar, is an image of the Virgin holding the Infant Jesus.